Stir the peanut butter, cream cheese and honey in a small bowl until the mixture is smooth. Spread 2 tablespoons peanut butter mixture on each of 4 bread slices. 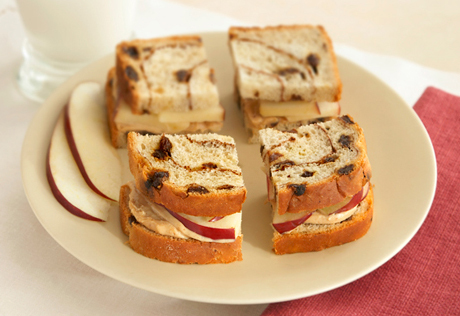 Top each with 1/4 of the apple slices and 1 remaining bread slice. Cut each sandwich into 4 squares. For a healthful twist, substitute Pepperidge Farm® 100% Whole Wheat Raisin Cinnamon Swirl Bread for the Raisin Cinnamon Swirl Bread and soy nut butter for the peanut butter. I mean, it's apples and 3 spreadable things on bread. Not very exciting. Kind of like kindergarten recipe.